Source: Spiewak R, Johansson SGO, Wüthrich B. Berufsbedingtes Asthma auf Fledermäuse (Chiropteren). Allergologie 1996; 19 (11): 509-511. Abstract: We describe a 31 years-old atopic patient, in whom after occupational exposure to Chiroptera bronchial asthma developed. The performed tests (skin test and RAST with bat allergens) confirmed the presence of an lgE-dependent allergic reaction to bat allergens. 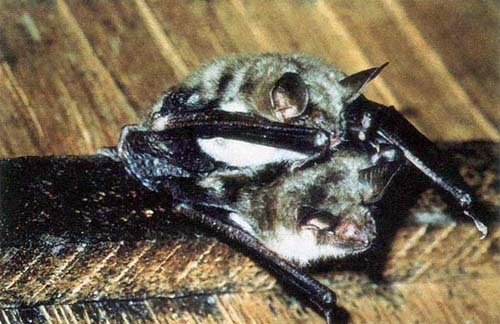 While the patient, as an engaged scientist, was not able to abandon the contact with Chiroptera, a specific immunotherapy with bat allergen extracts was undertaken. After one year of the therapy the patient had no more symptoms at contact to the Chiroptera. Key words: allergic asthma, occupational respiratory diseases, occupational exposure, speleology, wild animals, Chiroptera, bats, biohazards, IgE, rush-immunotherapy. Fig. 1. 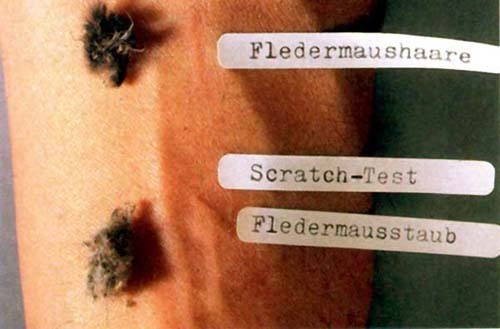 Scratch test results with bat hair and dust. Fig. 2. The bats Myotiz myotiz. For personal use only. © Dustri Verlag.